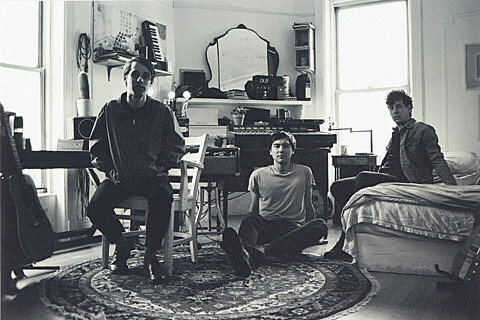 Brooklyn trio EZTV making very hooky, jangly, powerpop, very much in the tradition of ’80s artists like the dB’s, Tommy Keene or Let’s Active who were, in turn, inspired by The Rasberries and Big Star. The band have signed with Captured Tracks who will release a 7″ single, the Jarvis Taveniere-recorded “Dust in the Sky,” on April 28. You can stream that below. EZTV play around their hometown a lot and have a number of shows coming up. They’ll open for their Captured Tracks labelmates Mourn on Sunday (3/29) at Baby’s All Right (tickets), then Friday, April 3 at Cake Shop with Connections and St. Lennox. They’ll be back at Baby’s All Right on April 11 to play with UK band Happyness (tickets). For Ohio band Connections (who played BV-SXSW 2014), the Cake Shop show will be their NYC debut. EZTV will also perform live on WFMU’s “Prove it All Right” this Saturday (3/28) which airs from 9 PM – midnight. They’ve got non-NYC dates coming up, too and all are listed below.